Can’t wait for the summer? Neither can we! 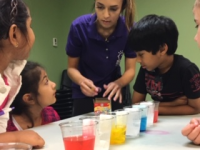 Join us for a preview of our newest summer camp topics and experiments. Each day campers will explore just a handful of the amazing experiments and builds that we will dive into all summer long. Register for as few or as many days as you’d like. Each day offers new builds and experiments! 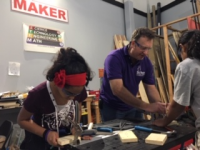 Spring Break is a great time to build and even polish your Maker Skills. Each day provides another opportunity to go hands-on with workshop tools and technology. 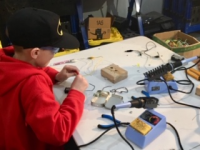 Not only will the students have a great time making, they will also acquire valuable skills to help them become better innovators and makers. Campers get to watch explosive stage shows before the museum opens to the public, have time to explore the museum exhibits as a class, and dive into hands-on experiments with experienced teachers in their classrooms. Children remain with Sci-Tech teachers in their grade groups all day. Sci-Tech camp staff are Red Cross Certified in First Aid/CPR/AED and have years of education experience. Safety comes first, then fun while learning. We hope that you join us for a day of STEM that they won’t stop talking about!